The weather would largely remain dry till January 13. After days of snow and rain in Himachal Pradesh, it was a sunny Monday with the minimum temperature recorded at minus 0.8 degrees Celsius here. “It was bright and sunny after three days of widespread snow and rain in the state,” a Met official told IANS. 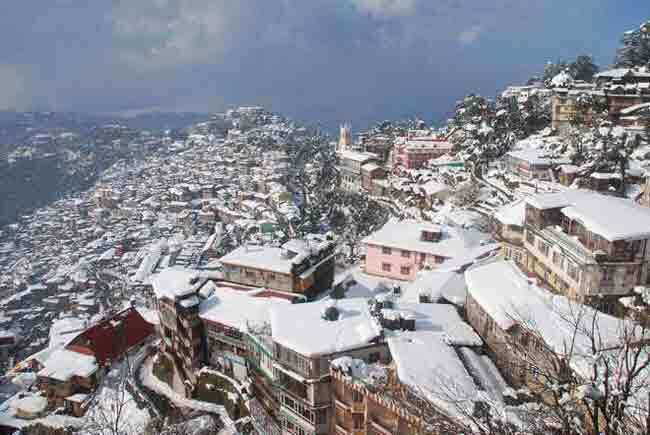 With temperatures nose-dived further, Shimla till Monday morning witnessed 53 cm of snow in the past 24 hours. The capital city’s nearby destinations such as Kufri, Fagu and Narkanda experienced moderate to heavy snowfall. Many areas here like the Mall Road, the Ridge, the US Club and Jakhu hills, as well as Manali, Chail, Kasauli, McLeodganj and Dalhousie were covered in snow. Keylong, district headquarters of Lahaul and Spiti, was the coldest in the state with the minimum temperature of minus 12 degree Celsius. Kalpa in Kinnaur district saw a low of minus 7.6 degrees, while the minimum temperature was 7.2 degrees in Dharamsala. The snow has cut off Kinnaur district and towns in Shimla district such as Narkanda, Jubbal, Kotkhai, Kumarsain, Kharapathar, Rohru and Chopal, a government official said, adding the road link to towns in upper Shimla is likely to be restored by Monday evening. Officials said the bad weather had affected road network in the higher reaches of Kinnaur, Shimla, Chamba, Mandi, Kullu and Sirmaur districts and efforts were being made to reopen them. The weather would largely remain dry till January 13, said the weather department.